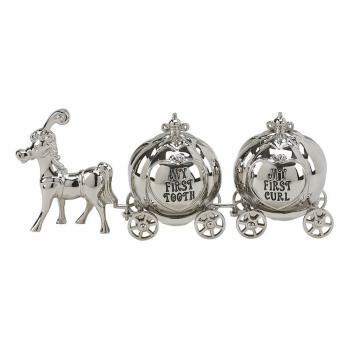 This horse and pumpkin set are a perfect keepsake for that precious 1st tooth and 1st curl. and the other is engraved "My First Curl" on each side. and the wheels actually move. Each of the 5 pieces hook together, the horse, 2 pumpkins and 2 sets of wheels. The bright silver color metal is nickel plated and will not tarnish. Overall measurements, 2" H x 5.5" L x 1.5" W.